I’ve been in Grant Writing Hell for most of last week and right through this long week-end. 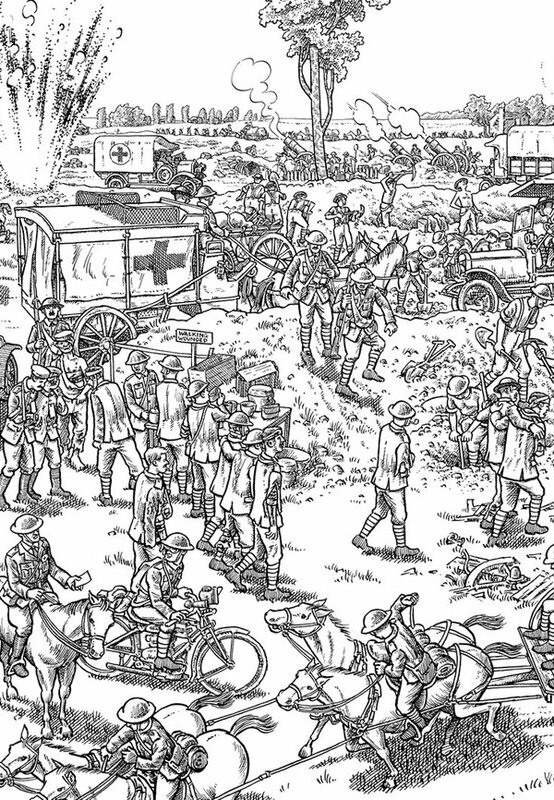 Everything has to be in by tomorrow morning, and I’ll post the final version of what has become Medical-military machines and casualties of war 1914-2014 once it’s done and I am in recovery (for an early preview see here). If only I could track down whoever persuaded the Social Science and Humanities Research Council (and the rest of the world for that matter) that drop-down menus achieve consistency and save time… They don’t; apart from the time taken to scroll through endless lists the pre-selected categories never seem to quite fit so you have to click “Other” AND THEN TYPE IT IN ANYWAY. Technically it’s not a book at all: The Great War is actually one continuous drawing, a 24ft-long panorama narrating the British forces’ experience of 1 July 1916, spatially and chronologically, from orderly morning approach to chaotic battlefield engagement to grim aftermath. There are no boxes of text or speech bubbles, no individuated characters, instead Sacco portrays a mass event in painstaking, monochrome, almost technical detail. It’s like a cross between Hergé and the Chapman brothers; the Bayeux Tapestry as a silent movie. The Great War is modeled in part on Mateo Pericoli‘s wordless Manhattan Unfurled, a beautiful, accordion-style foldout drawing of the city’s skyline. As a comic book artist, however, I felt impelled to provide a narrative, so the Bayeux Tapestry, which tells the story of the Norman invasion of England, was my touchstone. In the interest of making the drawing compact, I referenced medieval art in other, stylistic ways, namely by dispensing with realistic perspective and proportion. 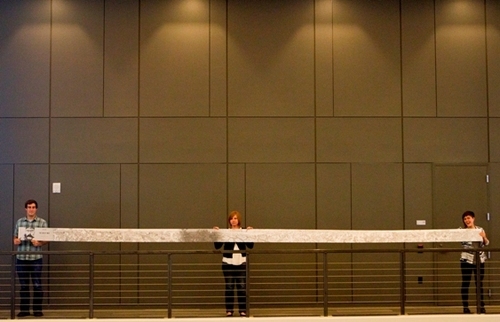 Thus a few inches in the drawing might represent a hundred yards or a mile of reality. However, I have tried to get the details — the field kitchens, the horse ambulances — right. 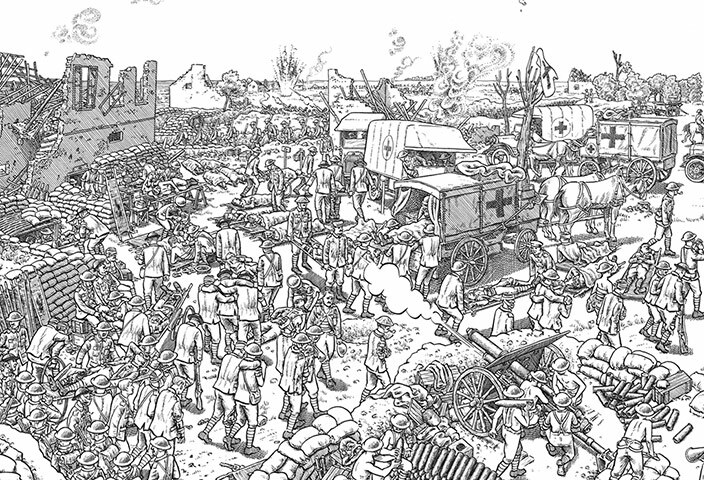 He’s also cited other influences – the late Joe Colquhoun‘s Charley’s War [there’s an excellent and probably unique interview here], Jacques Tardi‘s It was the war of the trenches (see here). Laura Sneddon has an interesting report from Sacco’s appearance at the Edinburgh International Book Festival earlier this year, where he situated The Great War in relation to his previous work (notably, for me anyway, Palestine and Footnotes in Gaza) and described his take on his combination of listening-drawing-reporting. I like the description of Sacco as a graphic journalist, and if you want to know more about his work there’s a short overview by Hannah Sender, a thoughtful review of Sacco’s Journalism by Rob Clough at The Comics Journal, and a fine short article by Reed Johnson published by the Los Angeles Times to coincide with Footnotes. In it, Sacco said he was at the point of thinking it was time ‘to walk away from battlefields…’ I’m glad he didn’t. If you’re in London later this month he’s appearing at the LRB Bookshop on Monday 28 October in conversation with David Boyd Hancock. This entry was posted in casualties, World War I and tagged graphic journalism, Joe Sacco, Somme, The Great War by Derek Gregory. Bookmark the permalink. 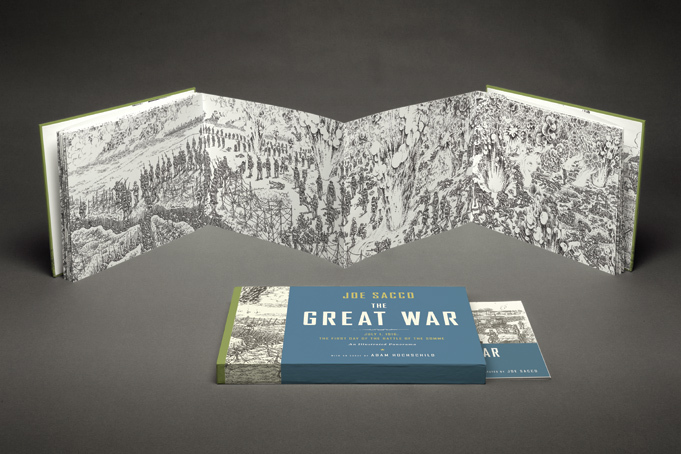 Derek Gregory on Joe Sacco’s stunning new title ‘The Great War, July 1, 1916’. Looks like an excellent caricature of reality.